I think they would be words that produce,grow,and bear forth goodness. 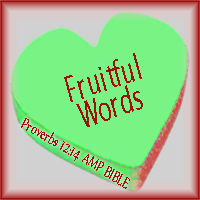 Fruitful words are beneficial for they produce good fruit in our lives and in others lives. Fruitful words cause abundant growth, and they profit us and others spiritually. Dear Lord, today my desire is that my mouth speak out only fruitful words. Words that will cause growth in myself and others. Words that will produce goodness and bring joy. I pray that the fruitful words I speak today will return to me to produce goodness in my life and in the lives of those I interact with, and through it all Lord, that You might be glorified. that thankfully acknowledge and confess and glorify His name.